Home > Resources > Summer Conference Papers > 2018 – Hereford > Rob Jarman – Sweet Chestnut In Britain – Roman Introduction? Rob Jarman’s presentation On the Sweet Chestnure in Britain – Roman Introduction? 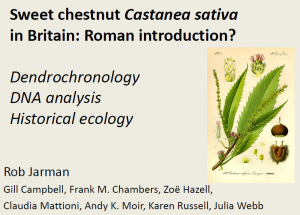 Rob Jarman - Sweet Chestnut in Britain, Roman Introduction?